People love using perfumes because it makes them smell great and feel better. Not only does smelling great make a person feel good, but it will make a person feel attractive also. Here are ways on how to make your own perfume so that you can produce a scent which is particular to you, and unlike any of those that you can buy either in store or over the internet. Tip 1. It is better that you use measuring devices that allow you to exactly measure out the amounts of oils and solvents required. If you do not, the perfume you make may not be what you wanted. Provided below, are a few easy recipes that you should be able to produce at home without too much hassle. To start, you will need the following laboratory equipments: a 10kg weighing scale or kitchen scale, plastic cups, a stirring rod, a small beaker and a 1,000ml beaker, and a volumetric flask with cover. For packaging, you may use either an atomizer bottle (spray) with a net content of 5 ml (P15 per bottle) or roll-on glass bottles with a net content of 10 ml (P16 per bottle). These are available at the Divisoria Market in Manila. Step 1: To start, put all the raw materials-except the alcohol-in small plastic containers or beakers for weighing. The alcohol needs to be weighed last because it easily evaporates when exposed to air. For accuracy, all of the ingredients must be weighed in grams, this is to ensure you are making quality scents. First, weigh the beaker or the plastic cups on the weighing scale. Make sure to adjust the scale to zero before taking your measurements. While on top of the scale, fill the beaker or the plastic cups with the ingredients and weigh. Step 3: Add the PPG to the mixture and stir. Always stir each time you add another ingredient, and make sure to completely disperse the substance before adding another ingredient to the mixture. Step 4: Finally, add the distilled water. To completely clean the empty container of the remainder of its contents, rinse it with water and add the resulting solution to the mixture in the beaker. Step 5: Thoroughly mix all the ingredients in the beaker until the perfume solution becomes homogeneous, then get your bottles and fill them with the perfume. Label and package your perfumes as desired, based on where you intend to sell them. This formulation for 100 grams of perfume yields 12 to 13 roll-on bottles.Your fragrances and perfumes must be kept in dry, cool, and dark places because light can adversely affect their chemical properties. As much as possible, use dark-color bottles for storage and packaging. Each time you need to get some of your raw fragrances, transfer them into smaller bottles. This is to minimize their contact with air, which may adversely interact with them. By using a volumetric flask with cover, you can keep your perfume intact and well-sealed until you are ready to package it. All you need for this recipe is some water, chopped flower blossoms (use lilac or lavender if blossoms unavailable). Place the flower blossoms in a bowl, add the water and then cover them and leave them overnight. The next day, the solution can be put into small bottles and sprayed either into the air or on to your skin. For this, you will need some distilled water, vodka, hypericum perforatum, cypress and rosemary (all of which are essential oils). They should then be mixed together and stored overnight. This is another recipe that may be worth trying out. Again, you will need distilled water, some vodka, Sandalwood, Bergamot and Cassis essential oils (which can also be purchased as fragrance oils). week. After this time, you can then transfer the mixture into small perfume bottles. The three perfumes above normally last for about a month before they lose their scent. Tip 2. 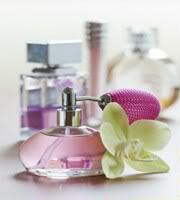 Put your perfume in a dark- colored bottle and must be kept in a cool dry place to make its shelf life much longer. 1. Sterilize a small dark glass perfume bottle. Add all ingredients and mix. This perfume will be good for six months. Store it inside the bathroom cabinet-out of sunlight. 1. Sterilize a canning jar in boiling water. Allow to dry or dry carefully without touching inside of jar. 2. Put lemon zest in the jar. Pour water and vodka over zest. 3. Stir with a stainless steel spoon. Add essential oils, seal and put in cool, dark place for one week. 4. Swirl contents every other day. strain liquid through cheese cloth or coffee filter. Put perfume water into dark (blue or amber) decorative bottle. First, you need a base. It can either be alcohol or a carrier oil (but the best is a mixture of the two together). The best type of alcohol to use is one which is odorless (say vodka) and mix this with Jojoba. Jojoba is particularly good, as it has a long shelf life, and once it is put on the skin, it tends to dry out and leave a wonderful scent behind. However, jojoba is one of the more expensive carrier oils, and I would suggest you experiment with one of the cheaper ones (such as almond or apricot kernel oil) instead. Then, once you are happy with the product you are producing, you can produce the same product but with jojoba oil instead. 4. Dropper (not all essential oil bottles have one of these included with them). Now we will provide you with the instructions for producing your first batch of aromatherapy perfume. alcohol (Vodka), and with the small funnel, place these in the bottle. 2. Next, add the essential oils from your chosen recipe (below you will see a number of different recipes, with the quantities of essential oils you require for them). You may need to get a dropper, as not all essential oil bottles come with one, and add a drop at a time. 3. After adding each drop of essential oil to the rest of the mixture, the bottle should be shaken (remember to put the lid on first before shaking). sure the lid is on tightly, and store in a cool dark place for 12 days or more. However, each day you should remember to give the bottles a shake at least 3 times. 5. After 12 days you can begin to enjoy the aromatherapy perfume that you have made. The first recipe below is specifically for those women who may suffer from nerves on their wedding day, and will help to feel much more relaxed and calm on their big day. The following recipes have been designed to help produce a much more calming effect to the person using them. These perfumes will help to focus you on your inner self, and provide you with a feeling of security, which will promote a feeling of total relaxation. The next recipes we are looking at will enhance a person’s mood and feelings of well-being. These perfumes will help to relax and surround you with warmth, as well as a feeling of pure luxury for those special nights out or at home with your loved one. 4. 2 teaspoons of Jojoba oil (carrier oil to be used when using essential or fragrance oils in perfume making). 1. Mix all of the ingredients together in a bottle and shake well. 3. Once it has been stood for 12 hours or more, you should now store it in a cool dry area. The next recipe we are looking at is in fact not a perfume, but a cologne, and contains lemon as the main ingredient. 1. Combine the essential oils with the vodka in a bottle and shake well. 2. Now set this aside for 3 weeks. 3. After 3 weeks, you will need to add the distilled water and then let it stand for a further week. 4. It is important that you shake the bottle once a day while it is standing over the 4 week period. 5. After 4 weeks, you can transfer the mixture to dark bottles for storage, or keep the mixture in the bottle it is in, in a dark cool place. The final recipe provided below is one which will produce a body splash, rather than a perfume, and has a citrus aroma to it. 1. Mix the fruit peels with the vodka in a jar, cover and let it stand for 1 week. 3. Now let the mixture stand for a further 2 weeks, and make sure you shake the jar well once a day during this time. Tip 3. Put your homemade perfume in a nice vintage perfume bottles, they will certainly provide you with an individual look that cannot be found when buying perfumes that have been mass produced. One of the best ways of selling your own perfume is through your friends, families and co-workers; you may also use them as giveaways for weddings and other special occasions. If you are marketing the products to teenagers, it’s better to put your perfume in spray bottles. If you are targeting office workers, however, putting the perfume in roll-on bottles would be a better option. Avoid using plastic as packaging material; they have dioxins that may mix or interact with your perfume. As you can see making your own perfumes, colognes or body sprays is simple, and once you’ve made your first lot and tried it yourself, you will soon want to be making more. Hi saan po ba tayo makabili ng mga ingredients? We manufacture high quality perfumes that sell at very affordable prices. We offer discounted rates to interested resellers/dealers nationwide. Currently, we have independent resellers in Metro Manila, Cebu, Cagayan de Oro, Davao, Zamboanga and we are looking to expand to more locations. You can sign-up for a business with us for as low as P2,000 only. Starter Packages are also available to help you jumpstart your business. To know more about our packages, kindly email us at info@scentswatch.com.